Behr paint was started in the back of Otho Behr Jr.s’ wood paneled station wagon. He began selling linseed oil paint to paint stores shortly after World War II. The stores began requesting a more durable paint that would perform better on redwood. So Otho Jr. approached his father, Otho Behr Sr, to help him create a paint that would meet the new requirements. Otho Sr was an accomplished chemist and created a new clear finish and stain. This new formula was able to better adhere to redwood and with this new process the business moved from the back of the station wagon to the Behr’s garage. In 1948 Behr paint moved from the family garage into an 800 square foot property in Pasadena, California. As a family owned business Behr Process Corporation continued to grow and expanded their distribution nationwide. The company opened facilities in California, Colorado, Florida, Georgia, Illinois, Missouri, Pennsylvania, Texas, and Washington.Otho Behr Sr. was a founder of Behr Process Corporation and also President of Behr Process Corporation until he passed away in 1962. After his death Otho Jr. became the president of the company. While Otho Jr. was president the company experienced rapid growth when they became one of the first suppliers to The Home Depot. Behr Process Corporation and The Home Depot have continued their partnership and to this day Behr paint is sold exclusively at The Home Depot. 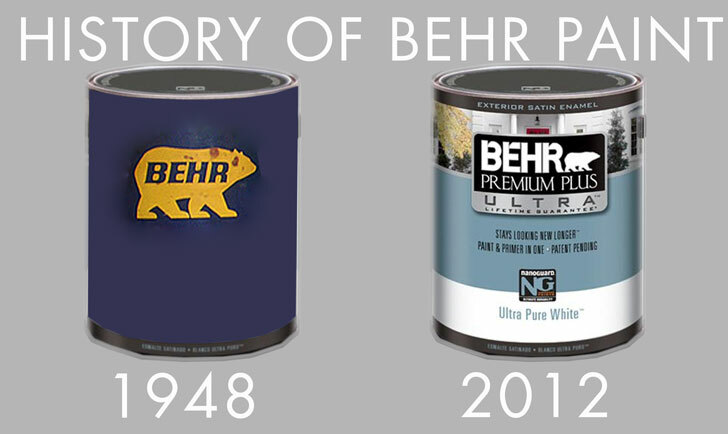 For the first 39 years Behr Process Corporation was only a stain and varnish manufacturer however in 1986 that all changed when the company expanded into interior and exterior paint. Since Behr first introduced their premium paints the company has continued to receive top recognition for quality products at an affordable price. The company offers the following types of paint products: Premium Plus Ultra Interior and Exterior Paints and Premium Plus Interior and Exteriors Paints and Primers. Along with specializing in paint the company offers products for wood staining and stripping, concrete projects, decorative finishes, and coatings for garage floors. Behr paint is recognized along with Benjamin Moore Paint and Sherwin Williams Paints as best known American name brand paints. In 1999 Behr Process Corporation merged with MASCO and was no longer a private business. Masco Corporation is one of the largest manufacturers for the home improvement and new home construction markets. Masco is a collection of over 20 different companies including Delta Faucet Company, Brasstech, Bristan Group, Milguard Windows and Doors, Behr, and many others. The merger between the companies was successful since both companies have a long history of commitment to quality products and operating with integrity. Then in 2007 in cooperation with The Home Depot-China Behr entered the Chinese market and began to sell their products to a new and expanding market. Behr has continued to meet new demands in an ever changing market place. The company’s website (www.behr.com) provides maximum interaction for the customers through the virtual color center. The website also provides an inspiration gallery and online workbook where customers can track their projects. The company has over 1800 color swatches and over 4000 colors available. Along with the company’s’ interactive website they created ColorSmart an app for the iPad and iPod in which the customer can color match from their favorite photo and preview many of the 4000 colors. During the companies’ history they have won many awards. In 2009 Behr earned the Webby Award in the lifestyle category for their new interactive website. The Webby Awards are the top international awards for excellence on the internet. Also in 2009 the company was honored with Horizon Interactive Gold Award in Consumer information for the websites ability to educate the consumer without the pressure of a ‘hard sale’. In 2010 Behr Premium Plus Ultra Interior and Exterior paint was awarded Building Products’ Most Valuable Product Award. One of the main reasons the paint received the award was because of its’ ability to save time and money as a paint and primer in one. Behr Process Corporation has also received awards for being a top workplace. For the past four years the company has received Top Workplace in Orange County. In December 2011 they were ranked number third in the largest workplace category. Throughout Behr’s growth the company and its employees have continued the ‘doing the right thing’ attitude. In 2003 Behr team members formed Behr Cares and have been focused on giving back to the communities where they work. The main way the organization gives is through fundraising, donations, and community service. Behr Cares also partners with the City of Hope and Habitat for Humanity. The City of Hope is a cancer research hospital and Habitat for Humanity builds affordable homes for individuals and families. Currently Behr Process Corporation is headquartered in Santa Ana, California and the Santa Ana facility has 725 employees. MASCO, the owner of Behr Process Corporation, stock is currently traded on the New York Stock Exchange (NYSE) using the symbol MAS.